Fresh footage has emerged from last month’s brutal crackdown by Indonesian security forces on the Third Papuan People’s Congress in Abepura on October 19. SBS Television broadcast the following footage which was also sent to West Papua Media. The footage shows plain clothes and uniformed security personnel shooting hundreds of rounds into the crowd, beating and brutalising scores of participants, and violently attacking the elected President of the West Papuan Transitional Government, Forkorus Yaboisembut. 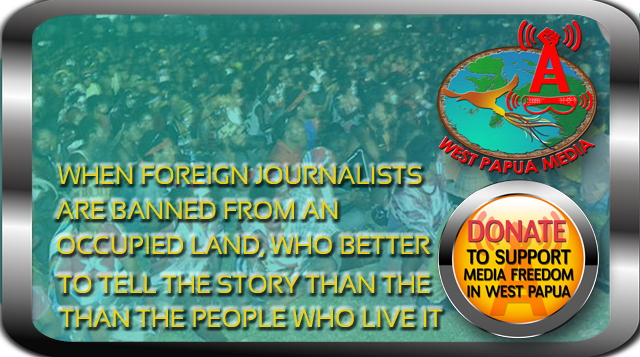 West Papua Media has also been provided with the remainder of the Congress footage through a source inside West Papua (via Tapol/ Down to Earth). We have decided to make this available for the use of all media. Please spread widely. Please be aware this contains images of extreme Indonesian state violence against unarmed civilians. MEDIA NOTE: For access to this original footage, please visit the contact page on this site and send an email or contact the number. It is the world moral obligation to support Papua to regain her independence from the new colonial role of NKRI. They cowardly use force to brutalize and kill the Papuans who express their legitimate civil and political right as the true owner of Papua Land. When facing Malasyan forces they were like chickens. All Papuans know the true history of how Papuans were fooled and forced to choose NKRI. NKRI, Autonomy and welfare are not what the Papuans need as by independence the Papuans will be more prosperous than NKRI. No doubt. From the movies one can easily see the infringement on the human rights of Papuans who participated in the Third Papuan Congress by the police. One can see the unnecessary humiliation of those arrested by making them crawl like animals or by having the partially undress. Indonesia will never become a state of law unless perpetrators of human rights violations of innocent civilians are brought to court. No democracy in the world can accept that its security forces act like if they are “a state in the state”and clearly above the law. Security forces should be accountable to the democratically institutions of the state..
stop the violence and try another way. Just talk with them. It proves that the Indonesian government indiscriminately against the violation of human rights. (what do readers think of the comments above?) The only reason people will live in misery is if the Indonesian military do not stop killing people. Self-determination is the most basic and universal of human rights. Who are you to deny Papuans that choice? East Timor separated because Indonesian was committing genocide on their people and had stolen their land. It was not bloody minded, it was a genuine act of free choice unlike your engineered 1969 Act of No Choice (“Vote for Indonesia or we will cut out your accursed tongues; We don’t want you Papuans, we just want your land. If you want a country of your own, then go and live on the moon” – Ali Murtopo, 1969: remember that?). And remember that the majority of the 21.5% were terrorised by the Indonesian security forces and/or were too gutless to stand up against the bully. The only people that support OTSUS in Papua as mean to freedom are those who are using it to exploit other Papuans daily for their own massive financial gain, like Joku, Messet and his cohorts, and the unbelievably corrupt thieves who are called bupatis. I am Sundanese muslim, and I’m very ashamed by what I saw here, I hope none of our Kujang/Silwangi troops were involved in these attrocities. Peace o my Papuan brothers, I verily support your fight for freedom. #$%# with NKRI, which only benefits the more aggressive (socially/culturally/economically) ethnics anyway. I do wish however, that the Papuan Christians will have peaceful coexistence with our Papuan Muslims brothers at the time you’ve gained full independence.